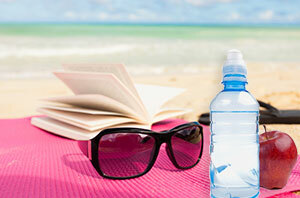 Everyone has sat in their work space and looked at a pile of tasks waiting to get done and thought of the beach. Before you know it you've spun a fantasy in which the radiant warmth of the sun is lifting your spirits as sea foam dissipates around your feet and a cool wind brushes off the water to kiss your face. To reach this objective of ultimate relaxation however is the dreaded packing of beach bags. There are a myriad of things to be considered when deciding what to pack in a beach bag, but there's no reason to begin a day dedicated to kicking back with totally flipping out. 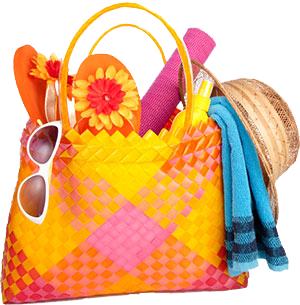 From my beach bag to yours, here are some tips from an experienced veteran. Skin care - Everyone's mom has harassed them about lathering up the sunscreen now so you "don't look like a leather pouch in ten years". As I've grown up and spent more time on the beach I've realized that this was less the manipulation I suspected to scare me into basting in spf and more a healthy dose of reality. So protect your skin now so you're still beautiful when you're older and remember, just because it comes with a higher spf, doesn't mean that it'll last longer. Towels - When contemplating the beach, your vision usually doesn't include riding home trying to brace yourself off your car's upholstery without pushing too hard on the gas or break. That's because in your idealized beach trip you usually become instantly dry as you leave the water, if your vision is anything like mine it probably also includes leaving about 15 pounds behind you as well. Sadly, that is simply not the way it works and hence towels are necessary and the correct number of them most convenient. Diversion - Playing in the water is exhausting and one of the quickest ways to end up cutting your fun in the sun short is to get tired. Fortunately there's an easy fix, just bring something you enjoy doing and take a few breaks! Before you feel totally worn out take a few minutes to refresh your sunscreen, read a chapter in that book you're embarrassed to admit you love or enhance your mental agility with word games. I'd advise steering clear of technology based fun as worst case scenario, water and tech don't mix and best case scenario, you'll still be finding sand in the cracks six months later. Sunglasses - When you take breaks out of the water, sun glare can become a serious problem, fortunately a solid pair of sunglasses is a pretty immediate solution. So feel free to crack open your books or look out over the water without fear of becoming suddenly blind or winding up with a headache! Food and Drinks - Another way to ward of tiring out half way through your day is to remain hydrated and have snacks readily available. Healthy snacks are a great way to recharge the energy you've lost without feeling bad about what you ate and help keep the calories you burned in the water off! 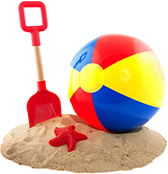 Toys for kids - The beach is a great place for kids to play and there are lots of fun options for toys and games both in the water and on the sand. However, don't forget that one of the greatest beauties of the beach is that it's interactive! Some of the best memories you take away with you will be games and silliness that was totally improvised. Regardless of how you play don't forget to keep an eye on where your kids are pay attention to current and undertow warnings. The beach is a great place to kick back and relax for some well-deserved solitude or build cherished memories with families and friends. With a little bit of preparation in advance, your day is sure to go off without a hitch; and with this guide and some imagination, so will your packing.